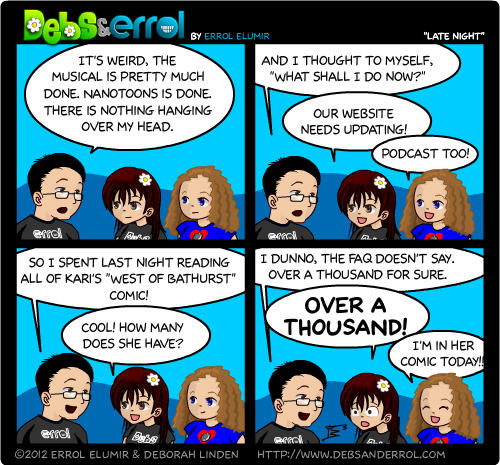 As a reminder, every 100 comics I get the users to submit their own Debs & Errol comics. The only restriction is that it is G-rated, and you somehow include us in it. It can be just Debs, it can be just me, you can just talk about us in passing! I need to get your comics December 6th by the latest! And what’s awesome, you can use Bitstrip too! Brian Layman has made some Debs and Errol characters! If you created a comic, email me at errol@elumir.com. For those who are curious: this Monday’s comic is #1180. That doesn’t actually mean that there are 1,180 comics. Oh, no; that would be too easy. There are 1,180 SEQUENTIAL comics…not including extras for April Fool’s Day, Mother’s Day, Father’s Day, the WoB anniversary, other random events, and, y’know, just because. (For instance, there’s a completely random panel in which Casey’s got tentacles coming out of his pocket.) There are also seasonal banners for Hallowe’en, Christmas, and Valentine’s Day; they tend to be just as involved as the actual comics. I take my procrastination from marking really, really seriously. Considering that the early game is the best part, I’m all for a wipe/restart. Although, to be fair, I don’t play with you folks and so my opinion doesn’t mean all that much, heh.